Note: All Mud and Musk Turtles can deliver painful and, in the case of the Mexican Giant Musk, dangerous bites. Many calm down in captivity, but extreme caution is always necessary. This 15-inch-long turtle shares its habitat with several crocodilians, and has developed an extremely thick shell (and, some say, a pugnacious disposition!) in response. It ranges from Veracruz, Mexico to Honduras, and is known locally as the Guau. A Giant Musk under my care at the Bronx Zoo is now in its 70’s, and has lost none of its willingness to bite when handled. Notoriously difficult to pair up, captive-bred animals have only recently become available. It is a mollusk specialist, easily crushing clams and smaller turtles in its massive jaws…mine even made short work of hard-shelled snails known as Periwinkles. This smallest of North America’s turtles is a mere 3 – 4.5 inches in length, and lives only in northwest Alabama’s Black Warrior River. Unlike its relatives, all of which sport high, almost “tortoise-like” carapaces (most pronounced in the Razorback Musk Turtle, see photo), its upper shell is extremely flat. Some believe this adaptation assists it in hiding from its many predators. In nature this species hybridizes with the Loggerhead Musk, S. minor. Four subspecies of Mud Turtle have been identified, with the eastern race being endangered in several states. Now bred in captivity, this droll little turtle is an excellent choice for novice turtle-keepers. The Eastern Mud Turtle often frequents brackish waters…in NY, it is known only from salt marshes and tidal streams. This most unusual turtle is only rarely kept or bred. Although but 5 inches long, its jaws are incredibly wide, and it can reach further back with its neck than even the Common Snapper. Some speculate that this arrangement helps them to catch frogs, which are common in the shallow, weedy ponds they inhabit. This is a “hands-off” turtle – I’ve had 30-year captives that remained as aggressive as the day they were collected. Despite that, they do well if provided whole fishes, snails, crayfishes and earthworms. Their pugnacious nature complicates breeding – I’ve yet to find a compatible pair. Sporting a lightly-striped, olive-brown carapace, the Striped Mud Turtle (please see photo) inhabits swamps and canals from southern Georgia to the Florida Keys. This turtle appears regularly in the trade…perhaps because, unlike its largely aquatic relatives, it frequently travels overland. It has been bred in captivity and makes a fine pet, although those I’ve kept tended to burrow into the earth for extended periods (wild specimens aestivate during droughts). Video of a Mexican Giant Musk Turtle. Awesome, thanks for the info. Just wanted to make sure. I do have another quick question if you dont mind, would adding sand to the bottom ( like mixed in with smooth water stones, that I already had in there) be a bad idea? off topic: I also had a random question ive been meaning to ask to about my FL green water snake, on wether I should be trying to switch it on to scented pinkies or just stick with fish. I mean ive been feeding it fish and its shedding like crazy, but i heard rodents are healthier in the long run. Whats the deal with that? Sand can clog filters, and is hard to clean with a si[hon-based gravel cleaner. No reason to feed any watersnake rodents; they rarely if ever take rodents in the wild and I imagine a steady diet could cause problems long term. Hello sir I just had a another question about my three stripe. These past two weeks She’s been acting different. She’s been continuously swimming about her tank. like scratching at the glass trying to get out you know? She’s stopped eating about a day or two ago and is coming out of the water alot more often. She’ll come out jump back in and then run around relentlessly. Before she was acting normal, always begging for food, constantly digging through rocks foraging for food exc. I’ve had her about three months and nothings changed, same temps, set up and so on.This seems like a hard question to answer im sure, but maybe you’ll recognize it. She’s still young three and half inches or so, ten gallon tank, basking light, a little under water cave, land area, water temps about 72 75 degrees and theirs plant cover (and the water depths about four and half maybe 5 inches). You think maybe its to small a tank? or maybe no resting areas that are like kinda in the water but real close to the surface? any tips would be appreciated. Nice to hear from you again…Interesting question. Common musks and some others will do that when the water is too warm, sometimes even when water is 8F or so; but I’ve not seen that with 3 stripes. Gravid females do the same if no nest site is available, but yours is young. An internal signal to hibernate may also be at work; many temperate zone turtles cease feeding in winter, even if kept warm; however they do not usually become active at the same time. Especially true of wild-caught individuals. You might try increasing the water depth, but in a 10 gal tank it may not make a difference. 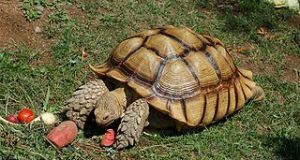 Perhaps move the turtle to a large plastic storage bin which has water and a sandy area; when mine burrowed I would unearth them once a week and try them in water. Sorry I could not offer more specific advice; after a time mine did return to normal behavior; Unfortunately, cycles, time frames and environmental triggers are greatly affected by captivity, so it’s often difficult to correlate behavior with season, etc. Thank you so much for the helpful info, you have no idea how grateful I am for these blogs. That seems like it might be the problem, because shes calmed down and is progressively eating more now. I’m going to move it up to a tub. I was also wondering if I could possibly move it outside? I live in miami,fl. I mean, they are found in the keys right? Thanks very much for the kind words, I appreciate them. Glad it’s going well; a tub outside would be ideal – natural sunlight, insects to feed upon; can’t beat it. Just be sure that it is predator proof – raccoons and rats can kill even adult box turtles. I’ve trapped raccoons in the heart of Manhattan, and of course in Miami anyth9ng from a jaguarundi to an ocelot may show up! 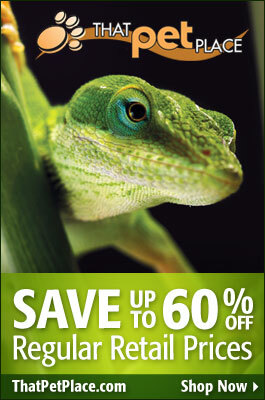 You might enjoy this article on raccoons and iguana interactions in Fla.
Keep an eye out for unusual cold spells as well. I’ve had hinged metal tops welded or otherwise attached to small cattle troughs…was at the zoo, so I had access to machinists, etc., but perhaps you can arrange something similar if you’re thinking long term. what the fastest way to get all the tannins out of mopani wood? Thanks for your interest. I usually soak and change water, but this is not always effective…some woods leach for years, (although I’ve not seen that with Mopani). Boiling in water with rock salt may hasten the process, and activated carbon in filter will improve visibility. Tannins are generally harmless to turtles. where can I find driftwood in the wild? like anywhere near water? Thanks for your interest. Technically, any sun-bleached or sunken wood can be called “driftwood”, but the types offered in the pet trade have had tannins leached out over time, and are usually of specific species as well. You can collect your own wood, but if it has not been under water or out in the elements for a long time, it will usually discolor the water (tannins and other substances may be released for years); such water will also acidify the water, which is harmful to most amphibians; effects on reptiles and fishes varies by species. I’ve found ocean beaches to be the best source of well-weathered wood, but it is usually hard to come by. Would care for the 3 striped be the same as a musk turtle? Would they need a UVB light? Care is the same; They do not need UVB if given a varied diet, but I’ve seen them bask so providing it might be good as a safety measure. Some individuals tend to wander out of water and bury into substrate, apparently in tune with a “inner clock” which may be prompting them to become dormant. That’s good to hear. Should take any special precautions with a small hatchling? The one I might get is about nickel or quarter sized, the commercial foods seem too big for it. Impt to provide a high Calcium diet..small whole fishes are the best source, freeze dried shrimp or prawn good also. Reptomin is excellent and can be used as is. larger turtle chows, trout chow soften quickly and also can be crushed before use. Earthworms/blackworms can be used regularly. Hello Frank, I have a problem with my mud turtle and I hope you can help me. My turtle started to swell like a week ago. She still eats, but is more lethargic. It looks like the swelling go away when I dry dock her (though not entirely), but it returns when I put her in water to eat. My other little turtle die almost two months ago, he started to swell too, and eventually started to present symptoms of a respiratory infection. The vet gave me antibiotic (with the same component that Baytril) and a hepatic protector. Unfortunately he died in the travel back to home. Right now I’m giving the medications to my other turtle, at least until I can afford to go to the vet again. My question is why mud turtles start to swell? It can be because a liver problem? Can two turtles develop liver damage two months apart? In almost eight years they never gt sick until now, and both of them. Hi. I currently have a adult female common musk and wanted to create a habitant similar to what common musk turtles have in the wild. I also wanted to know if you can send me pics of the enclosure that you housed your common musk turtle in. Thanks. I recently got a 3 stripe mud. He/she came one week ago today. He is in a 55 gallon tank with an approximately one third land and two third water set up. The land has a basking area with a sloped large rock section leading to a 6 inch water section. The water is 78° and the land has varying temps with the warmest being just under 90°. 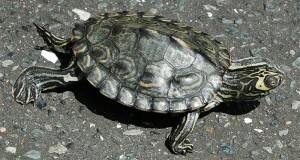 The turtle is one and three quafter inches and about a year and a half old I was told. He is currently eating reptilian pellets. My question is that he has not come out of the water at all since he’s arrived. I put him on the land section 2 says ago and within 5 minutes he was back into the water and has been there since. Is he still just trying to adjust to his new environment, is this normal behavior? I would also like to know if I can give him the same food I feed my leopard gecko which is a varied diet of Phoenix worms, crickets, and dubias in addition to his reptomin? Some rarely bask…especially when small, as they are the menus of many predators. If temperatures are good, as yours are, they may not need to warm up. If given a proper diet, this species does not need UVB exposure, and so does fine w/o basking.